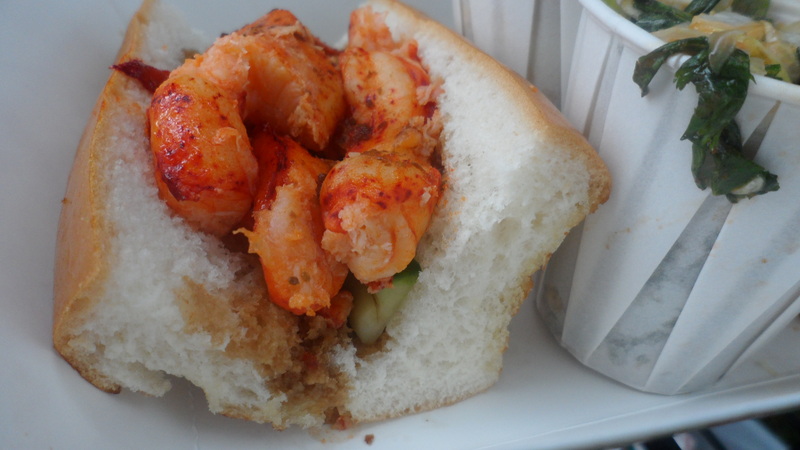 We told you about the LobsterCraft food truck a few weeks ago. 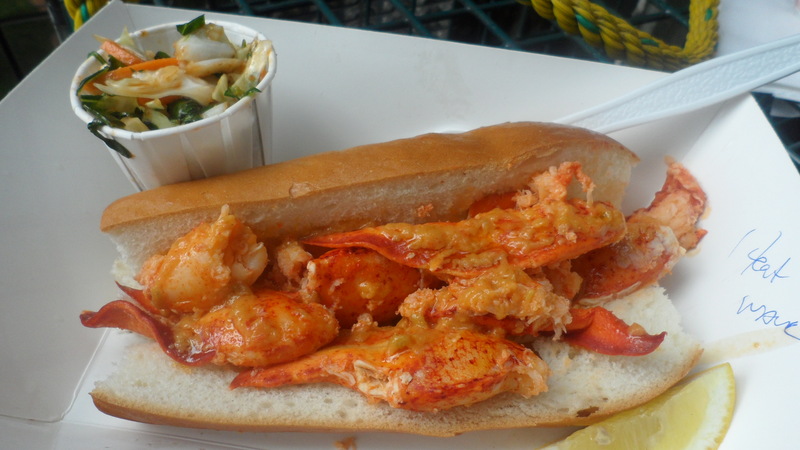 Gourmet, buttered lobster rolls, freshly caught from our local seas. Is there anything better, especially in the summer time? Nay, nay we say. Well, the stars and planets were in perfect alignment last Friday. See, we were both free during lunch so we headed to the Rowayton Farmers’ Market to check out the local goods and down some lobster rolls. As we walked through the market we searched around, like sailors in desperate search of land. Avast! We saw a truck and a few people hanging out around it, chowing down. We looked at each other, smiled, then walked faster. When we got to the window we saw they had four different lobster rolls to buy and even a lobster dinner for two at $40. We feel a Heat Wave ‘comin on! We both wanted the Heat Wave lobster roll. How could we resist? We placed our order and they gave us a choice of either kim chi slaw or regular coleslaw. We both went for the kim chi slaw that had a nice spicy kick and had a good balance of herbs and the vinegary taste of the fermented cabbage. The Heat Wave itself was a thing of beauty. Start with freshly baked buns from Muro’s Original NY Bakery and Deli, butter them, then grill them up. Next, pile on a generous amount of lobster, then coat the seafood in the habanero infused butter. While the roll had a spicy kick, it wasn’t too hot to handle by any means. There was also a nice balance of butter, too. Sometimes you feel like you’re drinking butter when you have a lobster roll, but this wasn’t the case at all. The meat itself was cooked perfectly and tasted so fresh. Squirt a little lemon on it and it’s PERFECT! This was Dan’s favorite! Part of the reason the lobster tastes so fresh is because Captain Mike Harden catches most of the lobsters himself from his boat named The F/V Jennifer Lynn. If he can’t catch enough lobster on a particular day, he’ll get the lobster from other local fishermen. You get the feeling that he’s been doing this for a while and it’s not his first rodeo, um, clambake, er lobster fest? 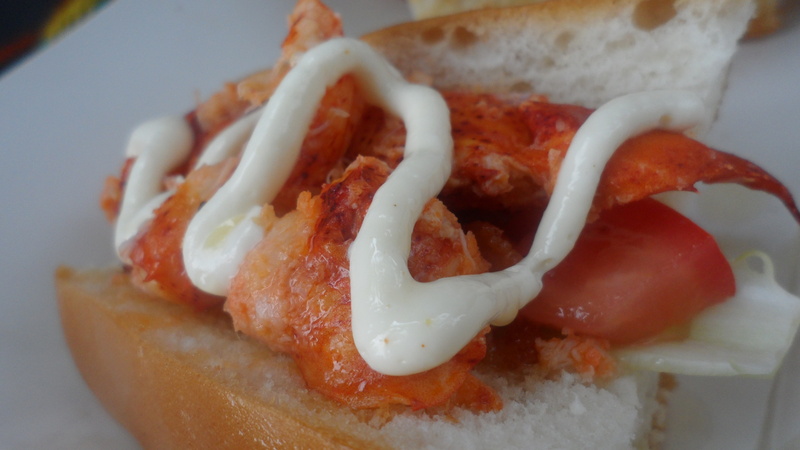 LBLT: The crispiness of the bacon and lettuce contrasted so well with the tenderness of the lobster. Killer. Plus, there’s bacon. Yeah. Bacon and lobster. There’s also a little aioli on top which we know can cause some controversy. See, there’s a huge debate about mayo being used in a true lobster roll (Kristien is not a fan) but this was just drizzle of aioli so it doesn’t count. California: Although they had run out of avocado, this was still a great roll. With the good green stuff, we could only imagine how much more awesome it would be. Starting off, the cukes added a nice contrast in texture and light taste and the ginger soy added a nice kick. This was surprisingly Kristien’s favorite. Not only will the truck be at the Rowayton Farmers’ Market on Fridays 12-5, but it also looks like LobsterCraft found a nice spot in Norwalk Monday-Wednesday. Yup, check them out in Oyster Shell Park at the end of Ann Street. That’s right in front of the Maritime Museum. They are also (thanks Danielle) going to hit up Westport Farmers’ Market on Thursdays. There are also plans to hit up Stamford! Check out their FB and Twitter for where they’ll be. Already thinking ahead to the cooler seasons, Captain Mike and LobsterCraft have other things up their sleeves (or claws). Think of a killer lobster bisque, lobster raviolis, and even a lobster lasagna. We think the new menu items will match the seasons well and we look forward to try these dishes, too. Also worth a gander is the lobster dinner cruise. You gather up 6 people then ride out on The F/V Jennifer Lynn. You’ll catch some lobsters and Captain Mike will put together a killah dinner. Info’s up here. i checked them out yesterday in SoNo. starting next week, they’re going to be near the Maritime Mondays – Wednesdays, at Westport Farmer’s Market on Thursdays and back in Rowayton on Fridays. i’m sorry to report that they did not offer kimchi slaw w/ my heatwave. :( i love kimchi!